Sigma F.C. 's Emery Welshman earned his second Player of the Week honour this inaugural League1 Ontario season, after a virtually unplayable performance in his outstanding four goal night versus Kingston's Cataraqui Clippers on Oct 8. "It has been while since I scored four goals, in fact I can't remember the last time that happened," he said, chuckling. "I just think I did a good job taking care of my chances. To be honest, I probably should have got one or two more, but I'm pleased with the goals I got. It was nice to play in my preferred position at centre-forward, and I hope I get more chances there." Welshman, who is a part of the original crop of Sigma FC players from ten years ago, is also one of their highest profile products. His performances, among other graduates, are an apt indication of the academy's ability to develop talent, and Welshman is quick to credit the Sigma system. "When I first started, Sigma were a travel team and they had just come back from a trip to Ajax when I arrived," he recalled. "They then became a full-on academy and then the young teams were added in; it's crazy how much things can change in under a decade. I'm excited to be part of it, and to see how much further it can go." "Sigma tries to implement the same system through all the age groups, which is: a possession style game; all the teams play a 4-3-3 system, and you can see in all the training sessions that the approach doesn't change regardless of the age level. Everyone is expected to train and play the same way, and you can tell it is working because the younger kids that have been called up since some of our college kids went back are doing the job. Another part is that they really try to help the kids get scholarships to the States. Not a lot of academies were doing that, they were just looking to develop for pro, but that's not always possible. Sigma even helps you decide what courses to take to get into schools." After attending Sienna and Oregon State Colleges, and competing successfully in the NCAA, Welshman went 16th overall in the MLS draft to his hometown club Toronto FC. However, Welshman was released from the club earlier this season, and the twenty-two year old found himself back at Sigma and considering his future options. He credits his Sigma colleagues for helping him stay focused and in the moment. 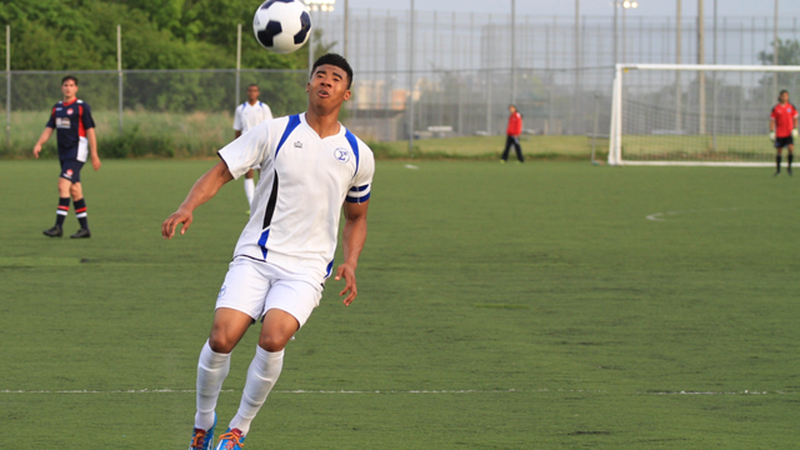 "I finished college and signed at TFC, which was a great experience, a great time. It was the highest point in my career so far," he recounted. "I didn't get a lot of chances to show myself there, which was unfortunate but that happens in this profession, and I'm just looking to move on now. After being released earlier this year, I didn't have a lot of time to find a club, but Sigma were playing in League1 though, and that brought me here again. I'm grateful they allowed me to come back, and it has been great to play with the boys. We've all had different experiences, but have come to the same spot and are enjoying it together. It may be the last chance that a lot of us have the chance to play with our friends at a high level, before people go off to pursue opportunities elsewhere." It is clear that after spending August in Germany on trial with third division club DSC Arminia Bielefeld, Welshman's talent continues to attract a high level interest in the global top flight. "It was a great experience in Germany, and hopefully I can get back there again. Still it's nice to be back and the quality in League1 is really good,” he said. "Like any league, you will find there are teams that are better and stronger than others, but it gives everyone good competition. I've played MLS, USL, PDL, and League1 isn't too different from a USL level. Of course, the difference there is that players are getting paid in USL and there are more experienced players, but talent-wise – the difference is marginal. It's really good to see these are all Canadian players aspiring to play professional and doing this for the love of the game. The league is doing a great job of getting people recognition, and hopefully the players that deserve to be in a fully pro league can get their chance through League1." For now, Welshman is just focused on taking life one day at a time, which means a personal goal of winning tonight's L1 Cup semi-final against Toronto FC Academy, 8 p.m. kickoff at Downsview. "We have a chance to win a cup, and what better way to do it then to knock out the champions of League1 in the process," he said. "The boys don't need any motivation, they're hungry and ready to play, and we're going there to do our best and hopefully we come out with the result."